We decorate our homes and doors with ornate wreaths, but why not bring that tradition to the breakfast table this holiday season? 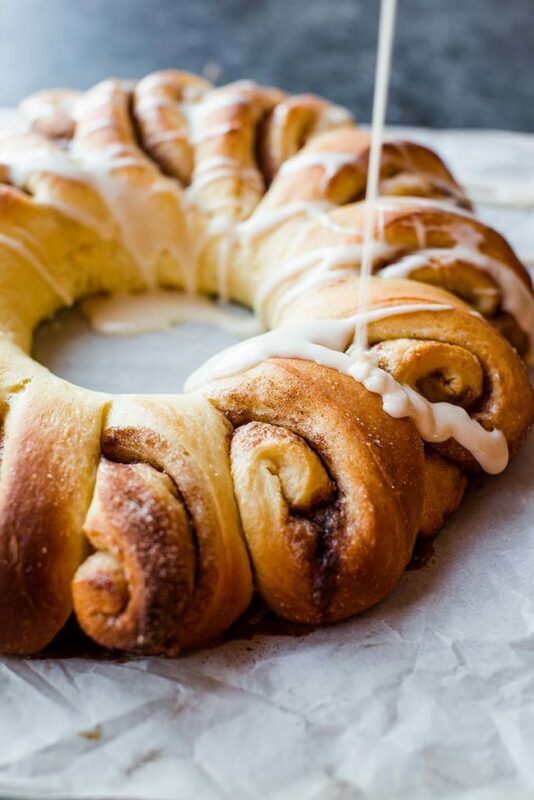 Impress your family and friends with a stunning cinnamon roll wreath that’s not only easy on the eyes, but simple to prepare as well. As long as you begin with a quality homemade dough. The cinnamon roll dough is made from scratch using Red Star Yeast Platinum. I recommend it because it’s a premium yeast that will strengthen and lift your dough. Your finished cinnamon rolls will have extra fluff, extra volume, and taste completely out of this world. After the dough rises, punch it down and roll it out into a large rectangle. Spread softened butter on top, followed by cinnamon and sugar. Roll it up and slice, only cutting about ¾ of the way through each roll. Now you can form the rolls into a wreath. I find placing a ramekin in the center will help the wreath hold its shape. As the rolls bake, they’ll develop a rich golden brown color. 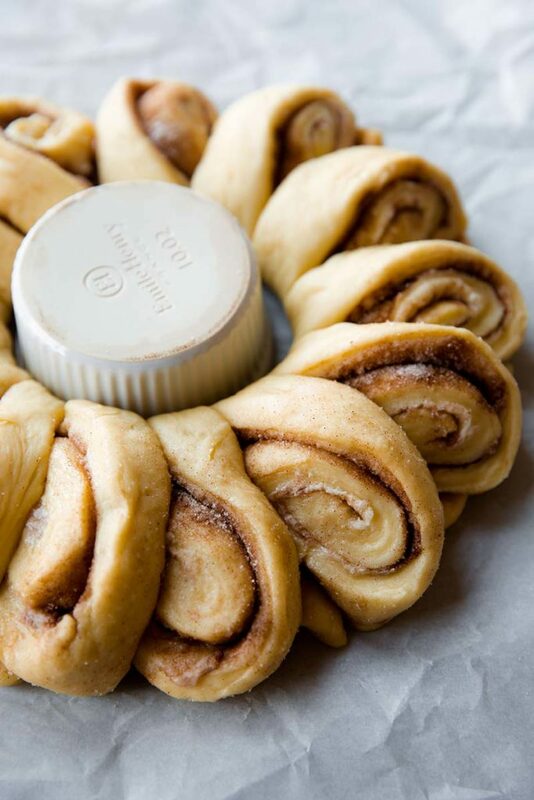 The scent of cinnamon rolls baking wafting through your home isn’t so bad either! A simple vanilla icing finishes the wreath off. 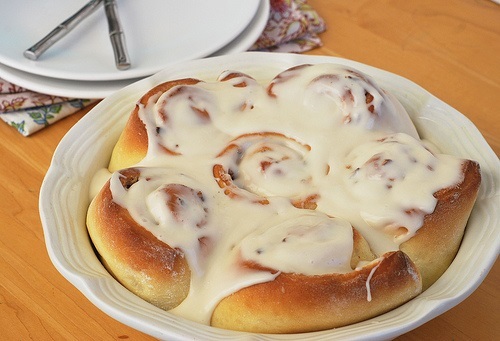 Cut the cinnamon rolls to serve or let everyone dive right in with their hands, pulling each apart. 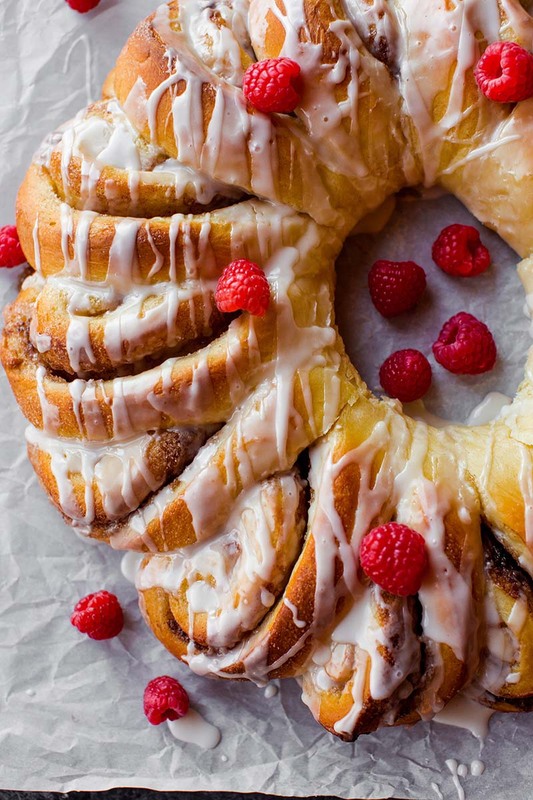 This is the most wonderful time of year for many reasons, but edible wreaths might just be the most fun! 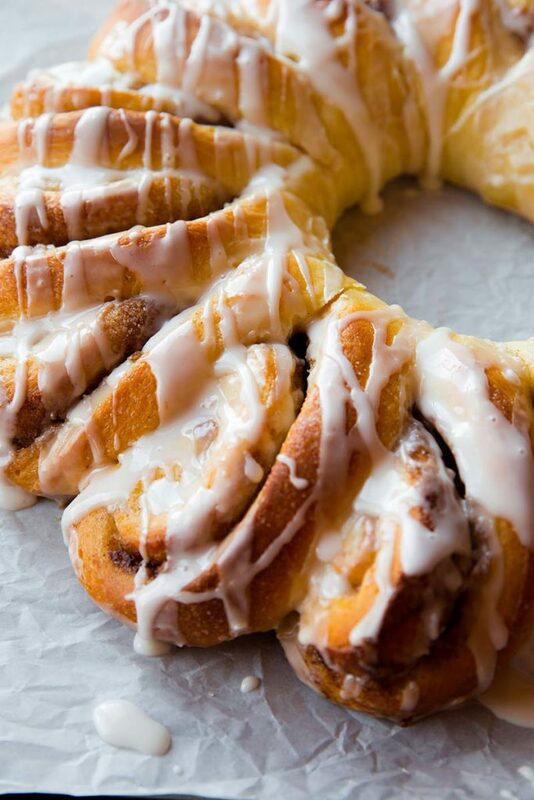 Adorn your breakfast table with this beautiful cinnamon roll wreath, complete with ooey gooey cinnamon and vanilla icing! Step 1: Make the dough: Warm the milk in the microwave for 1 minute. You’ll want it about 95°F. Pour the warm milk into the bowl of a stand mixer fitted with the dough hook attachment (OR you can use a handheld mixer OR no mixer, but a stand mixer is ideal). Gently whisk in the sugar and yeast. Cover with a towel and let sit until the yeast is foamy, about 5 minutes. On low speed, beat in the softened butter until it is slightly broken up. Next add the eggs, one at a time, and then the salt. On low speed, gradually add the flour. Once it is all added, beat on medium speed until a soft dough forms. Increase speed to medium-high and beat until the dough is soft and supple, about 5 minutes longer. 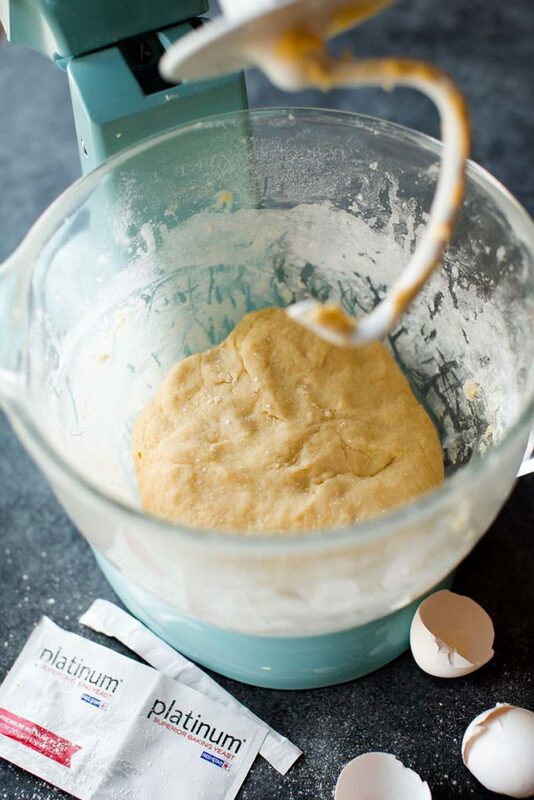 *If you do not have a stand-mixer with a hook attachment, knead the dough by hand in this step. Step 2: Form the dough into a ball and transfer it to a lightly greased bowl. Cover the dough loosely with plastic wrap and let sit in a warm environment until doubled in size, about 1½ hours. Step 3: Line a large baking sheet with parchment paper. Lightly flour the parchment paper. Place the dough on top and, with floured hands, pat down to roughly form a 9x14-inch rectangle. Make sure the dough is smooth and evenly thick. Step 4: For the filling: Spread the softened butter all over the dough. In a small bowl, toss the cinnamon and sugar together until combined and then sprinkle evenly over the dough. 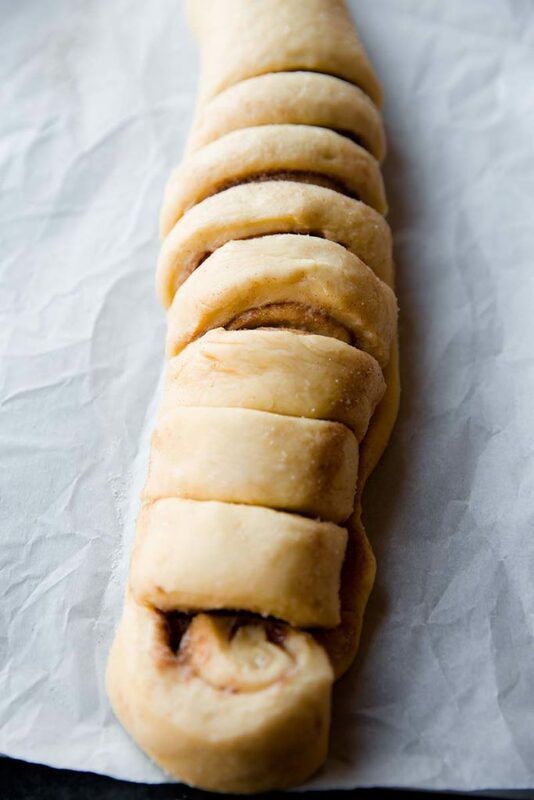 Tightly roll up the dough to form a 14-inch long log. Cut into 14 1-inch rolls, only slicing ¾ of the way through so they are still connected at the bottom. Step 5: Shape the wreath: Turn one of the end cinnamon rolls on its side. Turn the next one so that it slightly overlaps the first. Repeat with each roll, forming into a circle and overlapping each. Step 6: Place a ramekin in the middle of the wreath. This will help it hold its shape. Step 7: Cover the wreath loosely with plastic wrap and place in a warm environment until puffy, about 1 hour. Step 8: Preheat the oven to 350°F. Bake for about 25 minutes, until the rolls are golden brown. Remove from the oven and allow to cool for 10 minutes before topping with icing. Step 9: Make the icing: Whisk all of the icing ingredients together in a medium bowl. Drizzle over wreath. Overnight option: Prepare the rolls through step 6. Instead of allowing to rise in a warm environment in step 7, place the baking sheet in the refrigerator and allow the wreath to rest for up to 14 hours before baking. When it’s time to bake the next day, allow the rolls to come to room temperature and rise for 1 hour on the counter, or until almost doubled in size. Then bake as directed.